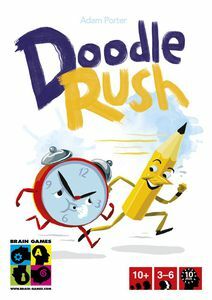 Doodle Rush, the name almost says it all: A game about drawing or better doodling and a solid potion flurry of activity. 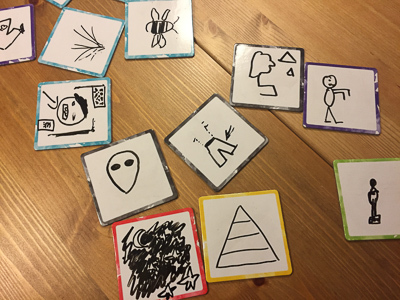 Once again the idea of the new game from BRAIN GAMES is quite simple: All players draw two cards with three words each. At a command all players simultaneously begin to draw these words on special drawing boards, one drawing per card. After one minute the drawing phase ends temporarily, and all players guess what the other players have drawn. 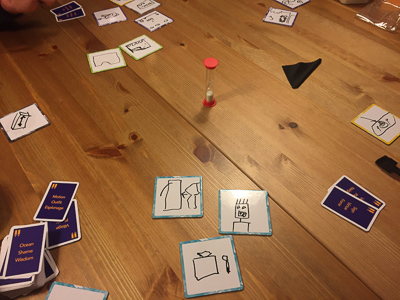 This turns out to be a very chaotic phase of the game, because on the one hand players guess any of the drawings of their fellow players, while at the same time they have to keep track on the guesses of their own drawings. In case of correct guesses the matching drawing board is given to the lucky player who guessed right. This guessing phase also ends exactly after one minute and the next drawing round starts again. It is allowed to redraw or add scratches to the drawings that have not been guessed yet and of course players can draw the terms they have not even begun in the round before. One minute can get very short, when your terms are more complex than e.g. a shoe. But it is your choice, Doodle Rush comes with double-sided cards, one with easy and the other with hard words to draw (and guess).